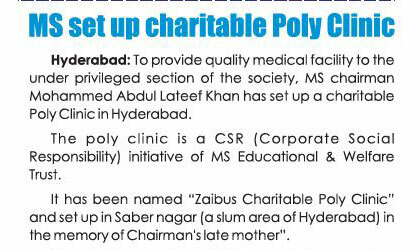 Hyderabad: To provide quality medical facility to the under privileged section of the society, MS chairman Mohammed Abdul Lateef Khan has set up a charitable Poly Clinic in Hyderabad. The poly clinic is a CSR (Corporate Social Responsibility) initiative of MS Educational & Welfare Trust. It has been named “Zaibus Charitable Poly Clinic” and set up in Saber nagar (a slum area of Hyderabad) in the memory of Chairman’s late mother”. Director Nizamuddin and his team, who is overseeing the entire initiative, informed “MS has started this initiative to provide the best medical facilities to the under privileged section of the slum area”. Detailing about facilities available at clinic, he said “all the modern medical facilities including x-ray and other diagnostics are available at the clinics. The patient can avail all these facilities including medical checkup, diagnostics and medicines for a nominal fee of Rs. 30/. Services of doctors and nurses are hired under the supervision of Dr. Rafeeq the renowned philanthropist. Senior Director Moazzam Hussain stated that in the coming days MS will open more such clinics in different pockets of the city so that it can serve more number of people. He said the clinic has also a diagnostic center and provide facilities of corporate hospitals for a very nominal fee of Rs.30/- for visit and Rs.50/- for X-ray.